Yesterday I finished my second juice fast, this one for 35 days. I lost 17 pounds and 11.5 inches over 6 measurements this time. As of this morning, I only have 8.4 pounds left to lose to get to my goal weight. That is the lowest weight I have been at for many years. My loss rate was less than it was for the first juice fast, but I'll take it. Maybe the less you have to lose, the harder it is to lose it. I brought down more clothes from the attic this week that fit again and put away those that are now too big. That felt good. WooooHoooooo, you brought down more clothes from the attic that now fit. That is fantastic. Yes, get rid of those big girl clothes because I am confident that you are not going back to that condition. Congrats Shari, I am so proud of you. What does your transition look like for the next few weeks? RM, my transition has not been much of a transition since I had to make food for the family reunion today. I ate some of that yesterday and will take some to the family reunion today. I ended up gaining back some weight, so now the weight remaining to lose is 10 pounds. Weekdays are more scheduled for eating with being at work, so that should be better. Oh my, I made the most delicious salad tonight. I used a fresh whole fennel bulb, oranges, and mint. I am somewhat new to fennel, so I had no idea how good it can be as the base of a salad. Fennel has a licorice taste & flavor, and is used as a vegetable (the bulb), as an herb (its willowy fronds, and as a spice (its seeds). I do not know any other plant that is this versatile. I do not know why I waited so long to try it. Fennel is rich in fiber and soluble vitamins such as A, B, and C. It is also a good diuretic, so helpful in reducing blood pressure. 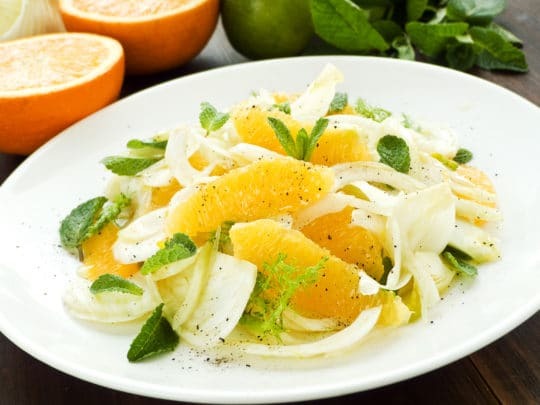 Ingredients: one large fennel bulb trimmed and thinly sliced, 2-3 oranges peeled, 2 tablespoons of craisins are optional, 1 to 2 tablespoons of lime infused olive oil, 2-3 sprigs of mint to garnish. Add pepper to taste. Directions: 1. Lace the cut pieces of fennel on a serving plate, 2. Section oranges and place on top of fennel, 3. Top with craisins, optional, 4. Reserve some fennel fronds to garnish the top of the salad. Drizzle with lime oil and pineapple vinegar. This salad is really fun and tastes delicious. Enjoy. Hello Reboot Friends, I was talking about probiotics to our new members below and wanted to share a link to my favorite probiotic especially if you are having any sort of medical problems. I tend to have acid reflux, and when I take this probiotic it completely goes away. If you are having hunger, cravings, or junk food temptations, consider adding a probiotic to your daily routine to reduce these issues. It really worked for me. Ramesh, I did not realize that potassium levels could get too high. I did some research, and included a link from the Mayo Clinic below. However, I would also recommend that you post the same question to the Reboot with Joe Nutritionist. Do you know how to do that? If not, go to the Reboot website (same as this website) and Discussions. choose "Ask The Nutritionist" option. This is a free service and they are there to answer questions like this. Once you post your question, they will get back to you within 24 hours. Because this is a very important question, I know they will answer quickly. May I ask how long you were on your juice reboot and if it was a juice only or a modified reboot? Do you have any kidney problems? The Mayo Clinic article said that not drinking enough water can make your blood potassium levels go higher than normal. Are you drinking enough water? The article also lists foods to reduce to get your potassium levels down. They recommend reducing the following foods: bananas, nuts, beans, milk, potatoes, apricots, cod, and beef. I do hope you have time to read the article, and this can be a serious medical condition. Here's a great green smoothie to get started with. Practically anyone will drink this recipe - kids, resistant hubbies, people who give you the scrunch face when they see anything green - it is just delicious. As you become used to it, reduce the amount of fruit you add! I just watched a documentary on youtube called Powered by Green Smoothies. I'm going to look more into green smoothies as a complement to juicing. I look forward to sharing what I learn on this journey to health. Hi! I'm reading a book called Thrive that talks about cravings for junk food. The book attributes it to emotional stress and nutritional stress. In simple terms, if you're craving sweets specifically, it is the brain asking for sugar which releases dopamine and makes the brain feel better. However typically this meant humans tried to find an apple to eat when the brain asked for sugar. These modern days we have ice cream, chocolate, etc. so the craving might manifest in that way. I take fruit as a snack at work to help with work stress. The book also attributes general cravings for junk food as nutritional stress; when nutrition needs are met, the cravings go away. Myself, I would try amping up my daily intake of greens - both in juicing and in green smoothies. The puree texture of green smoothies puts them in a pre-digested state, making it much easier for the body to absorb the nutrition from greens than when you eat say, a salad. Personally I have a juice and a green smoothie everyday. Thanks Maddogcupcake! Your explanation makes sense because I definitely still have the 'diet mentality.' Even though I've seen that I lose more weight when I increase my juice consumption, I still don't drink juice when it is time if I'm not hungry. I'm currently trying to change my thoughts to 'fuel my body for health' and not 'cut calories to lose weight'. I'm reading Jason Vale's Juice Yourself Slim, but once I'm done, I'll look into Thrive. I need all the motivation and knowledge I can get to stay on track. Hey Krysty and Reboot Friends. I had something really weird happen yesterday and the day before. I posted responses to your posts and when I hit enter, I got an red error message saying the post was too long. However, it was not very long so do not know what this means. Has this ever happened to you? So let me try to respond to Krysty again, and I will keep this really short for now and respond more later. First of all, Bravo to you for completing your 60 day reboot. This is a phenomenal achievement, truly. I like Anna's suggestions to try the green smoothies or simply a green based juice. I completed a 100 day reboot, and still do at least one 32 ounce green based juice everyday. If I do not, I can feel the diffference in my appetite, cravings, temptations, and energy level. Will write more soon. Hi!!! I just finished a 32 day juice fast, and have been pretty dang hungry already. I previously did a 7 day fast, and I also fast 1 day a week. However, I have never felt this hungry when ending a fast. I have had a very healthy diet since January, but since ending my fast, I notice I want less healthy foods (pizza), also something I hadn't experienced before, since when I'm eating normally I really don't crave those things. I'm still eating pretty well- lots and lots of veggies- just curious of others had a similar experience ending your fast! Thanks! Also AK, yes it is super common for the the beast of hunger to awaken with a vengeance when you come off a fast! Your body says, "Wow, the famine is over. I need to pack on pounds because I don't know when the next famine is coming and I want to survive that one, too!" Hence, crazy hunger. If you read any book about fasting from a fasting guru, there is a ton of advice in it about disciplining yourself when you come off the fast, because hunger can be extreme! They often say something like, you're an old pro at eating but you're no longer a pro at digesting, so how you come off the fast can either preserve your health gains or, if you come off the fast poorly (eating too much, or eating bad foods) you can actually do a lot of harm because your digestion is not in full swing yet. Hang in there and don't cave! The first week off my fast, I stuck mostly to only 2 or 3 foods (watery fruits) and only focused on increasing QUANTITY everyday. The second week and third week, the goal is increasing the variety of foods, so I am eating puree soups, avocado, green smoothies, broths, raw salsas, etc. I have had almost no weight gain and little stomach discomfort. Good luck! Welcome AK, thanks for your post and congratulations on your 32 day juice only reboot. This is terrific. I agree with Mad dog cupcake, aka Anna, that your body may be experiencing a hunger cycle because you went off the fast. However, I did not experience that because I continued to have 2 juices a day the first two weeks, and then 1 juice a day after that. What does your eating transition plan look like? Also, there could be other reasons you are hungry. Are you under more stress than usual? What are you craving? Sugar? Is so, you could have a yeast or gut microbiome imbalance. Are you taking a probiotic? If so, this will help alot. I look forward to your next post. Keep up the good work. AK, pick up some articles on the iimportance of good gut bacteria and a healthy microbiome. It feels like a Monday, but it is actually Tuesday. Yikes. What new piece of information can you share with the group today? I look forward to hearing about your progress and new knowledge. My new piece of information is about something called "Fat Bombs". I thought it was a joke when I first heard about it, but after some research did find nutritional articles from experts I trust. What are Fat Bombs? Fat bombs are little low-carb, high-fat treats that became popular from people on the keto diet… they can be either sweet or savory—that you can eat as a replacement meal or a fun snack. They’re loaded with fats that curb your appetite and rev up your metabolism. Many people report that fat bombs give them an extra boost of energy for a workout; and help them fight cravings for hours and make your taste buds happy. If you are eating fat bombs to lose weight, they recommend you eat them as part of a low carb diet. Eat them once a day as a snack or to up the level of healthy fats in your diet. Many people eat one for breakfast or lunch on the go. Apparently they are super easy to make, and you can take them with you in the car or commuter bus. They support a low carb, keto diet Here is a recipe I am going to try this week, and it mainly has just three ingredients in it: fat, flavor, and a fun filling. Also, one fat bomb is only 88 calories each. My list of RM recipes grows longer! I will post when I make them. Happy Sunday Evening Friends: How is everyone doing this weekend? I am doing alot of cleaning, organizing, and getting rid of things. I have too many books, CD's, DVD's, clothes, and the list goes on. Along with getting rid of excess weight, I am getting rid of stuff I do not need or use. I am making a run to the consignment and charity stores tomorrow, and my car is full and ready to go tonight. Yippeeeeee. I made a delicious Chimichurri Sauce today, and it is amazing. I have heard about Chimichuri Sauce, but have never had it and have definitely never made a batch. This is a wonderful sauce to have ready in the fridge, and I have been using it on almost everything today just for fun. Ingredients: 1 cup of fresh Italian parsley, 1/2 cup olive oil, 1/3 cup red wine vinegar, 1/4 cup of fresh cilantro, 2 peeled garlic cloves, 3/4 teaspoon dried crushed red pepper, 1/2 teaspoon ground cumin, 1/2 teaspoon salt. What a fresh and wonderful addition to any meal. As a bonafied sauce-a-holic, I thank you! This is going to the top of my list. Anna, I am so happy that you like this healthy sauce recipe. Yes, I put it on almost everything. Enjoy. Low heat sautee 2 leaks, 1 onion, 1 carrot, 6 cloves garlic. Add 8 cups low-salt veggie broth - two heads of broccoli with florets cut off and stems peeled & chopped - 2 chopped plum tomatoes. Low temperature simmer for 25 minutes. Add 8 oz. of baby spinach and 1/4 tsp coriander, 1/4 tsp nutmeg. Let cool a bit. Put in blender and puree. Add 1/4 cup lemon juice. Done! Super Yum Anna! Thanks so much for sharing this great broccoli and spinach soup recipe. I honestly have been looking for one, and this one looks perfect. I will buy the ingredients and make it next week. I just made a big pot of soup, so need to finish that one up first. I love having soup in fridge and in my freezer for those busy days when I do not have time to cook. Thanks again for sharing this great recipe.